By now the whole world knows that NBA player, Jason Collins, has come out of the closet. His announcement has been met with mostly positive comments. It has appeared that America has turned a very important corner in tolerance and acceptance. Of course, you knew it couldn’t last long. Enter the Westboro Baptist Church. 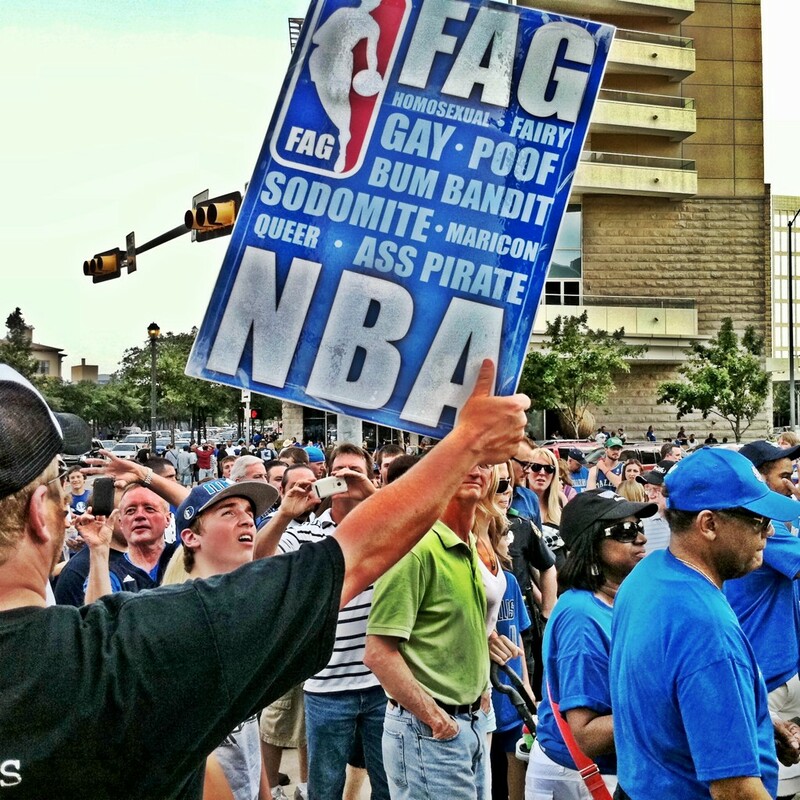 You know them, they’re the “God Hates Fags” people. And they really do not like Jason Collins or the NBA, for that matter. I’m not sure why they have to pick on poor Kevin Durant but I guess they really don’t need a reason. It should be pointed out that this “church” is basically made up of the family of the Reverend Fred Phelps (no relation to Michael Phelps). So it is kind of hard to take them seriously. But they do seem to get a hell of a lot of media coverage. I guess I’m guilty of enabling them, too. This is probably not the endorsement that Broussard wanted but I guess you have to take what you can get. Oklahoma City and Chicago better get ready for an onslaught of literally 8-10 protesters descending on the arenas. People hate LeBron James. I mean really hate LeBron James. They hate the fact that he left Cleveland. They hate “The Decision.” They hate that he went to Miami and teamed up with Dwyane Wade and Chris Bosh in order to win a title. And they sure are going to hate it when he wins his first championship. He’s going to win a championship. The Miami Heat are one win away from winning the NBA Finals. But the people that hate him are in a shrinking group. Mostly located in Northeast Ohio. LeBron has won a lot of people over with his play this season. Myself included. I’m certainly not going to become one of the slobbering LeBron Apologists that can see no wrong in what he does, even when he does wrong. And I’m not a bandwagon fan who sees that he is about to win a championship and wants get a bit of his shine. I’m a sports fan and there is no better storyline than that of redemption. And that is what LeBron James has done this season. He’s redeemed himself. He has had an incredible regular season and a spectacular post-season. He was the league MVP and he will be the Finals MVP. And he has pretty much kept his mouth shut and not said anything stupid and egotistical like last season. There have been no lame routines with his team mates like in seasons past. He’s playing like a professional. He’s playing with purpose. America loves a comeback, and LeBron has made a great comeback this season. It’s going to be interesting to see how the rest of the media will portray LeBron after the Finals. I’m sure ESPN will continue to slobber all over him as usual. They will probably even take a victory lap. But will the rest see the changed person that I and others have seen? I hope so. Will the fans that hated him finally give him some credit? I’m sure some will. Winning has a tendency make people like you. LeBron James has been through one hell of a journey. He went from most loved to most hated faster than any celebrity ever has. I hope this season hasn’t only changed the perception of LeBron but I hope it has also changed him as well. The annual NBA passion play is about to start. I’m talking, of course, about the NBA Finals. This years version has the Miami Heat reprising their role as villain and the OKC Thunder will step in as the basketball savior. The story goes something like this: the Heat are the basketball equivalent of the Death Star, wreaking havoc throughout the NBA Universe. If they are allowed to win an NBA title all hell will break loose and their reign of terror will last forever. Everything that is good and holy is at stake. The Miami Heat has assembled a team of mercenaries with a singular focus: bring a title home to the Evil Empire…I mean South Beach. They have stockpiled a team of supreme talent fragile egos that has been the scourge of the NBA. The OKC Thunder, on the other hand, has quietly built a championship-caliber the old fashioned way, through the draft and nurturing young talent. Its a classic tale of good and evil, right and wrong. Kevin Durant has to step in as hero and destroy the Heat. Sure, he is young and this is his first Finals and its not fair to put the fate of the entire basketball universe on his shoulders but that’s what makes for great drama. Luckily, he has help. Russell Westbrook and James Harden (along with the bench) will put their stamp on this series but it will be Durant who will lead the Thunder to the championship. Make no mistake, LeBron James, Dwyane Wade and the rest of the Dark Side will not go down easily. They will fight till the end. Unless LeBron has another 4th quarter disappearing act like last year this series could easily go seven games. And that would be some great drama. I just hope that one game we can see the Thunder in their white uniforms and the Heat in their all black ones. That would let even the most casual fan know who is who. I am looking forward to watching this drama unfold before me and I’m pulling for the good guys to win. That’s why I’m picking the Rebel Alliance…err…the OKC Thunder to win in 6 games. The Miami Heat are in big trouble. Not only are they on the verge of being eliminated from the NBA playoffs by the Boston Celtics but they are on the verge of being dismantled. After losing Game 5 at home last night, the Heat have been subject to even more scrutiny than usual. And no one is safe. Most of the criticism has been aimed at head coach Erik Spoelstra. There is no doubt that he has made mistakes and has been out coached. Not playing Chris Bosh down the stretch in the fourth quarter might have sealed his fate. Even if Bosh wasn’t 100% you still have to put him out there to give yourself a chance to win. Like most of his team, he seems to fold under pressure. I can’t tell if he is infecting the team or they are infecting him. No matter what happens, Coach Spo will probably not be back next season. But you can’t blame everything on him. LeBron James and Dwyane Wade deserve some blame, too. Both of them will disappear for stretches at a time. LeBron has always had a weak psyche. When the team is winning he is the first one out there posing and preening for the cameras but when they are losing he sulks and seemingly gives up. He’s like the bully who finally gets punched in the mouth and runs off crying. The whole team is like that. Charles Barkley was right when he called them a “whiny bunch.” They are. The fact that LeBron and Wade didn’t show up for the post-game press conference last night proves it. They were sulking in the locker room instead of facing the press. If Kobe Bryant had done that he would have been savaged in the press. When the Heat win they can’t wait to tell everyone about it. When the lose they pout like petulant little children. And that is what the Heat are missing. They lack the maturity to deal with the ups and downs of professional sports and the mental toughness to needed to compete for a championship. The head coach can’t instill it in the team. LeBron James never had it. And Dwyane Wade is losing it with each passing game. If the Heat lose Game 6 in Boston (and they probably will) you can expect to see some major changes in the Heat organization. You will also see the end to the failed experiment of stacking a team full of superstars in an attempt to win a championship. The Heat Era is about to end and the Team Era will return to the NBA. And that’s what we’ve all been missing. I know the NBA Conference Finals have barely started but I want to skip ahead and talk about the NBA Finals. LeBron James and Dwyane Wade are playing at such a high level its almost scary. They aren’t getting too much out of the rest of the team but so far they haven’t needed it. They will need it when they meet up with the Spurs in the Finals, though. And that’s where the problems will start. The Spurs are just too good and too deep to be beaten. The Heat will not be able to keep Tim Duncan out of the paint and no one has had an answer for Manu Ginobili. It also doesn’t hurt that they have one of the best point guards in the league with Tony Parker. 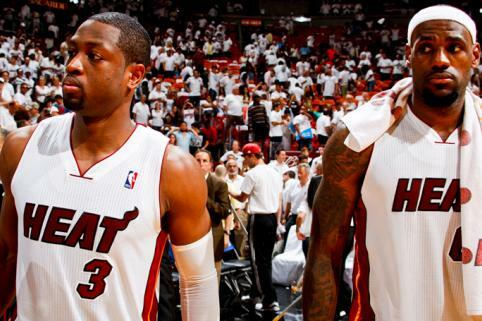 LeBron and DWade will have to score 80 combined points each game if the Heat are to have a chance to beat the Spurs. And I just don’t see that happening. That’s why I’m picking the Spurs to win in 6 games. I know it seems odd that I’m willing to ignore the Conference Finals happening right now but the Heat and Spurs seem so far ahead of the competition they are bound to meet in the Finals. I hate to spoil the playoff for you but this is what’s going to happen. Miami Heat Down 2-1! Who’s To Blame? The Miami Heat have fallen behind the Indiana Pacers 2-1 in their playoff series. But with the reaction of fans and media you would think the Heat were on the brink of getting swept. Dwyane Wade didn’t help the cause when he had one of the worst games of his career and then topped it off with a shouting match with head coach Erik Spoelstra right on the court. I know the knee jerk reaction is the blame LeBron James for everything but this time I think the blame lies with Wade. Sure, King James hasn’t really come through in the 4th quarter like everyone wants him to but that’s really not shocking. That’s expected. What wasn’t expected was Wade to fall apart just when his team needed him most. With Chris Bosh out and the Heat bench not producing at all, its falling on James and Wade to carry the Heat. But it seems like Wade is melting under the pressure. He’s taking cheap shots at other players, complaining about the Pacers celebrating after their Game 2 win in Miami and now he has a problem with his coach. I would never have thought that Wade would become a villain. After all, this isn’t the WWE. Sure, you would totally expect Hulk Hogan to join the NWO and turn into “Hollywood” Hogan but nobody saw this coming. There is already a chorus of fans and media calling for Wade to be traded. If the Heat get bounced out of the playoffs by the Pacers you can be assured that one of the Big 3 will be gone. One thing everyone needs to remember is that Dwyane Wade is the only one who has a championship ring. That ought to count for something. Dwight Howard Destroys Orlando Magic!! I have been watching the Dwight Howard Saga all season. As a Sports Blogger it was an interesting story. As a Lakers Fan I wanted to see if he was coming to LA. That was, of course, until Andrew Bynum started playing like the best center in the league. I became an objective observer at that point. I watched Howard go from city to city and say how much he would like to play there. After a while it seemed like there WASN’T a city he didn’t want to play for (that is, except for Orlando). He delivered to Magic management, a list of teams that he wanted to be traded to. And that list kept growing. After a while, it got to be tedious. Then it became embarrassing. It’s no secret what Dwight Howard is doing. He’s doing exactly what LeBron James did when he left Cleveland. Only Dwight is doing it in public. LeBron let the Cavaliers believe they had a chance to keep him so they wouldn’t trade him. That way, when he was a free agent he could go to a team that wasn’t completely gutted. 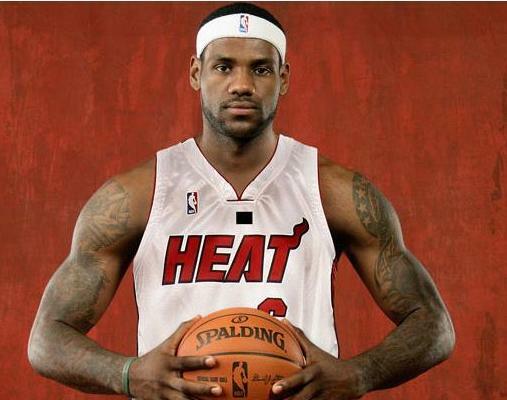 Think about what Miami would have to have traded to get LeBron. It’s no secret that Dwight wants to go to the soon to be Brooklyn Nets. The Nets would have to give up Brook Lopez and a few other players to get Howard. But if Dwight waits until July 1, when he is a free agent he can simply sign on the dotted line and call the movers. Of course the magic would be without a superstar and would have nothing in return. Just like the Cavs ended up. And the Magic can’t really trade him either. He has stated that he would not sign an extension with a team to which he was traded. Who in their right mind would rent Howard for half a season, trade away big parts of their team, only to watch him walk out the door on July 1? I don’t see any team willing to take that risk. 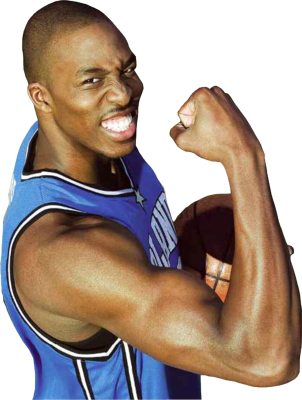 So, in effect, Dwight Howard has destroyed the Orlando Magic for the foreseeable future.